American Zen is "America's First Buddhist Rock Band™" founded in 1992 by The Hippy Coyote when he moved to Salt Lake City, Utah. The Kung Fu Cowboy Rock & Roll Movie 1 movie features the music of American Zen. 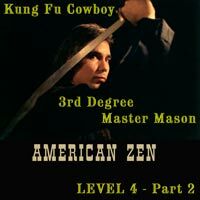 American Zen released 4 albums prior to the screenplay of Kung Fu Cowboy Rock & Roll Movie 1. Songs from each of these albums are included in the movie. All songs and poetry are written by The Hippy Coyote, who has become known as "Kung Fu Cowboy" since the early 1990s when he wore his Stetson cowboy hat to Kung Fu and Tai Chi classes in Utah. "Men don't carry umbrellas," Coyote would explain, "they wear a hat." 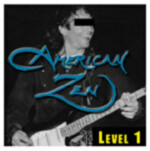 American Zen was created to lead fans on a spiritual journey of enlightenment and Nirvana. The American Zen website at www.AmericanZen.org, contains 8 LEVELS of spiritual enlightenment. Starting with LEVEL 1 = Peace Of Mind, American Zen told the story of starting a new life in Utah and away from parents. The website includes stories and poetry to entertain and explain the hardships of the band. LEVEL 1 is the lowest level of survival in which all humans struggle for financial, personal and marital success. 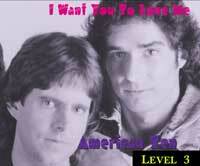 American Zen composed and recorded the album, LEVEL 2 = Christ Killer, while battling the Mormons of Utah. By the end of the album a peace was arranged by some of Coyote's high-level Mormon students who took his Tai Chi and Shaolin Chi Mantis Kung Fu classes in Salt Lake City. 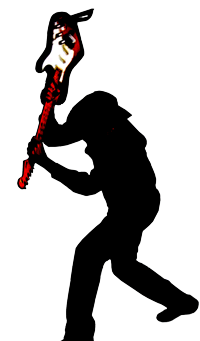 "Christ Killers" are any persons who use religion as a weapon or seek to injure the soul/spirit of anyone. LEVEL 3 = I Want You To Love Me is a romantic album of hopeful romance and ends with the poem, "Patience," about a girl who couldn't keep her pants on when her love wasn't around. These "feel good" songs will cheer up anyone. This album was prescribed to a fellow stagehand of Coyote's who'd lost his wife the prior day. He said it really cheered him up. Coyote invented his "bass poetry" on this album by recording the poetry then adding up to three bass guitars playing in harmony in the background. 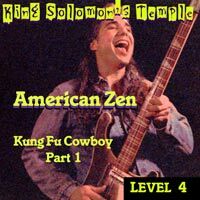 LEVEL 4 = Kung Fu Cowboy PART 1: King Solomon's Temple is an artistic album as Coyote was becoming free of his responsibilities of being a Mr. Mom for 18 years. Coyote's autobiographical songs were transposed into the love triangle of Hiram Abif, the architect of King Solomon's Temple. "Kill The Spider" is about his murder by three fellowcraft masons. Coyote became a 3rd Degree Master Mason that year, so his life was focused on the symbolisms and teachings of this ancient brotherhood. Coyote continued to create his "bass poetry" with songs "Dear Lara," and "Boy and King." This album ends with King Solomon on the steps of his unfinished temple in Jerusalem. LEVEL 4 = Kung Fu Cowboy PART 2: 3rd Degree Master Mason begins with the execution of the three fellowcrafts who murdered Hiram Abif. In a magical and amusing story that again parallels Coyote's personal life, the album portrays the difficulties of King Solomon and his wives. This album completes the Masonic legend of Hiram Abif and the foundations of modern Freemasonry. The book, MASONIC KUNG FU, was written during the recording of these albums. 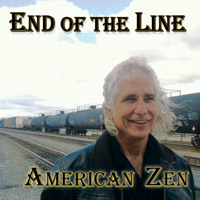 END OF THE LINE was released July 4, 2014 after the studio Richard Del Connor was mixing in went belly-up. They couldn't pay their electric bill and Shaolin Records couldn't afford any more studio time--so this album was released half-cocked to keep our release date and special 12-Step Album Release Party. These songs were written in the order they appear on the album while Coyote was writing the book, Supersoul 13 by Buddha Z. 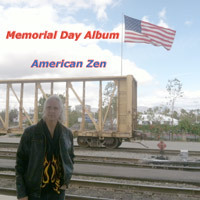 MEMORIAL DAY ALBUM was written Memorial Day 2014. Coyote woke up Memorial Day morning and recorded the entire 45-minute album on his iphone with lyrics seeming to come from several ghosts who told their war stories through Coyote. Some songs are pro-war. Some songs are anti-war. Some songs are just stories about living in a war zone as a soldier.